BMX (bicycle motocross) is a bicycle sport. BMX riders use BMX bicycles. BMX racing is done on tracks that contain twists, turns and hills. Up to eight riders leave a starting line at the top of the starting hill and race quickly to the finish. Riders race close together but must not touch any other rider. Freestyle BMX is an extreme sport. There are five major categories: street, park, vert, trails and flatland. Street involves the rider doing tricks on stairs, rails, curbs and walls. Park is using a skatepark and riding on the ramps there. Vert BMX riders perform the same types of tricks as street riders. Instead of using obstacles on the ground, the vert rider performs tricks in a giant halfpipe. Riders go up each jump, performing tricks in the air before landing. Trail riding is also called dirt. This is high-speed riding over jumps and doing tricks between the jumps. Flatland riders perform tricks on flat ground. They spin their bikes in tight circle and perform acrobatics. BMX racing began in the early 1970s when some teenagers in California, USA, used their bicycles to imitate cross-country motorcycle riders. By the mid-70s, new bikes that were tough, that could be twisted, turned and bumped without falling apart were being made. The first organised BMX racing events were held in 1975. BMX riding tricks are performed in streets and parks on a variety of ramps, rails, walls and other obstacles. 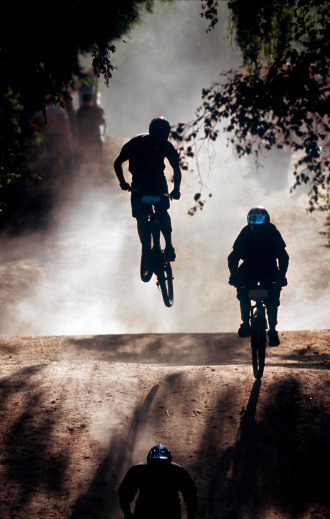 This form of BMX riding is known as street BMX riding. BMX (bicycle motocross) was part of the cycling program at the 2008 Olympic Games in Beijing, China. There were individual event for both men and women. In Olympic competition, races were held on circuits of around 350 metres, including jumps, banked corners and other obstacles.